February went by quickly, but it was another busy month for arts and culture across the state, and as we look forward March will have even more events. Florida Heritage Month takes place from March 15 to April 15, so watch for events taking place statewide. The Florida Keys are more than sunshine and saltwater, frozen drinks and four-day cruises. The island chain has always beckoned to a legendary roster of writers, painters, performers and artists, and still calls endlessly to others who appreciate those endeavors. Artist Mario Sanchez, playwright Tennessee Williams and author Ernest Hemingway never heard the term “cultural tourism,” and certainly weren’t aware that they were giving birth to a new industry while they lived and worked at the intersection of the Atlantic and Gulf. But the arts have become more than a passion in the Florida Keys. They’re an industry — a cultural tourism industry, which has been steadily gaining momentum in Monroe County. Other cities and areas have also been working to stress the importance of arts and culture in their communities. The DeLand City Commission has partnered with the Florida Museum of Art in the hopes of incorporating public art and redevelopment projects to encourage economic development. The city of Bradenton is using the unique Village of the Arts — billed as Florida’s largest art colony — in a renewed effort to draw tourists to the area, particularly those with an artistic bent. In Boynton Beach the city spotlighted the fifteen large kinetic art sculptures that were installed over the last year, and St. Augustine has been celebrated as a world-class art and music destination. The famous Florida Highwaymen were busy throughout February with the Third Annual Original Highwaymen Weekend Extravaganza that took place in Davenport at the end of the month, and a special event featuring the artists and their paintings at the Museum of Florida History on February 5. The Florida Highwaymen was a group of 26 black artists who studied painting together and took their unique, colorful paintings of Florida landscapes to sell on the road and door-to-door during a time when many galleries would not let them display their work. Famous Highwaymen paintings have included serene sunsets, sleepy Florida rivers, arching palm trees, crashing ocean waves and bright red palmetto trees. Florida Secretary of State Ken Detzner with members of the Florida Highwaymen during the February 5 event at the Museum of Florida History. Image courtesy of the Museum of Florida History. 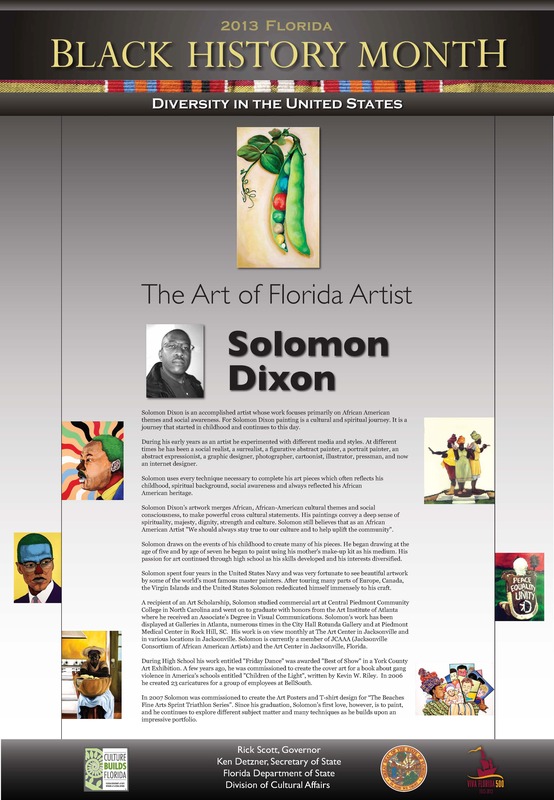 Solomon Dixon was chosen as the featured Florida artist for Black History Month 2013. February was Black History Month, and numerous events took place across the state to honor the contributions of African Americans through arts and culture. The First Lady of Florida chose Solomon Dixon as the featured artist for this year. There’s a lot going on in March. The state finals for Poetry Out Loud will take place in Tallahassee on March 9. Also remember to keep up with the Florida Heritage Month calendar and submit events that are significant to Florida heritage, arts or culture, open to the public, and appropriate for audiences of all ages. You can also check for upcoming happenings at Art & Gator’s Event and Festival Calendar and the Viva Florida 500 calendar. Florida Heritage Month will take place from March 15 to April 15. This entry was posted in Culture In Florida and tagged Boynton Beach, Bradenton, culture builds florida, DeLand, florida division of cultural affairs, Florida Heritage Month, Florida Keys, Florida State Fair, Highwaymen, Museum of Florida History, Robert Schlageter, Secretary of State Ken Detzner, St. Augustine, Viva Florida 500 by culturebuildsflorida. Bookmark the permalink.